A 35 year law enforcement veteran, Steve is the only person to have served as a handler, trainer, and supervisor for the Seattle Police Canine Unit. Accredited as a Master Trainer in 1993 by the Washington State Police Canine Association, Steve is also a past Executive Board Member of that body. He served as Vice President of the Certification Council for Pet Dog Trainers, (now called the Certification Council for Professional Dog Trainers) and has been an instructor for the K9 Academy for Law Enforcement. Steve has instructed at seminars in the U.S., Canada, Japan, Mexico, Belgium, Spain, and the United Kingdom. He is currently a primary instructor at Karen Pryor's ClickerExpo and the Karen Pryor Academy for Animal Training and Behavior. He has taught obedience classes at parks, community centers, and kennels. 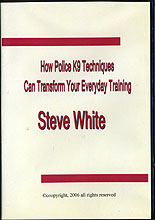 His articles have appeared in police K-9 and dog training publications in the U.S. and Canada. He specializes in teaching behavior modification, urban and rural tracking, and scent work through the use of positive reinforcement-based operant conditioning. Through his company, i2i K9 — Professional Training Services he provides consultation and training to K-9 units on administrative and legal issues, and has been recognized as an expert witness by Washington and Federal courts in Police K-9 and dog behavior matters.